When choosing a disabled bathroom flooring product, keep in mind that safety and good mobility are the two most important issues to consider. If you're not sure what type of disabled bathroom flooring is best for your new floor, there are several things to keep in mind before making your choice. least once, so choosing slip-resistent flooring is paramount. independently, it is necessary to provide a proper floor for easy maneuvering. Experts in handicap bathroom designs for the accessible bathroom suggest these flooring products for handicapped bathrooms as the best materials, whether you are replacing old flooring or building a new wet room for the disabled. All are non-slip and non-glare, which are important practical features for disability use. Vinyl flooring is a common ADA flooring choice that meets the ADA bathroom requirements for public facilities and it makes a great all-round choice for the home as well. Non-slip - Vinyl bathroom flooring provides traction for wheelchairs, walkers, canes, and crutches, without being 'tacky' when walking on it. Matte finishes are best for superior traction. Water proof - It repels water, especially if you use vinyl roll flooring, rather than tiles. A one piece vinyl floor is excellent for providing a water proof floor area. Easy installation - This is perhaps one of the simplest types of flooring to install for any type of handicapped bathroom. You may not even need a contractor to do the work for you. If you're a bit handy, you may be able to install vinyl flooring yourself. Reasonably priced - Vinyl is one of the most cost effective floors that you can find, especially if you check with a few discount sources in your local area or online. Also, since the bathroom is a smaller area, you may be able to find a quality remnant that is perfect, but that is cheaper. Wheelchair friendly - A smooth, even vinyl floor provides one of the best surfaces for wheelchairs and scooters. Few negatives - There are very few negatives associated with good quality vinyl flooring for a handicapped bathroom. That's why it remains an ADA flooring choice. Cork flooring is a quality choice for handicap bathroom designs and offers extensive features. Non-slip and padded - Cork is naturally non-slip and offers a natural, warm padding underfoot that is very comfortable. Practical for those who can walk independently or are on walkers, crutches or canes. Water proof - It is also water proof and dries easily when dampened. It's easy to clean with a damp cloth. You can add a sealer to the surface for additional protection. Mold resistant - Natural cork is mold resistant and is perfect for bathroom areas, where high humidity and moisture is common. You won't have problems with mold growth on a cork floor. Easy to install - You can find cork flooring in click-lock tiles or tiles that are installed with adhesives. Depending on your skill level, you may be able to install this type of flooring yourself. Be sure to have a level sub flooring on which to place the tile. Pricey - Cork floors are a bit pricier than vinyl, but you can find very good deals through discount flooring companies both online and offline. Not wheelchair friendly - Cork is not generally wheelchair friendly flooring because it has a cushioning effect and can somewhat impede the movement of wheels on wheelchairs or scooters. Can scratch or discolor - Cork is also subject to scratches and imperfections in the finish over time. It also can darken in color over time. Another common flooring option is mosaic tiles that add functionality, durability, and style. Note: Be sure to choose a matte-finish mosaic tile for a handicapped bathroom floor. Durable - Mosaic tile is made from glass or ceramic and can last for many years. 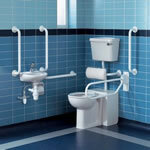 It stands up to high traffic, dampness and is great for use in a total wet room for the disabled. Nonslip - Again, be sure to choose a matte-finish mosaic tile, since a glazed finish is more slippery when wet. For additional nonslip protection, you can coat the finished floor with a clear, slip proof floor coating, if you have any concerns. Floors and walls - Mosaic tile can be used on both floors and walls for a wet room or bathroom. Style - This tile can be found in just about any color and quality level that you prefer. If you're artistic, you can have your entire bathroom designed in a beautiful color theme with various colors interwoven into a particular design. Adds value - A beautifully tiled disabled bathroom adds value to any home and gives it more appeal to buyers. Moderate difficulty for installation - Most people will need to hire a tile and grout specialist to install mosaic tile flooring in a bathroom. There are several steps involved in laying tile correctly, starting with the proper sub flooring and ending with sealing all the grout after application. In most cases, it is best left to an expert. Pricey - While tile itself can be purchased at reasonable prices, depending on what you prefer, it is the labor and design requirements that add to the cost of laying a mosaic tile floor to the bathroom. Also, if you decide to use it for the walls, plan on spending a few extra bucks! Moderately wheelchair friendly - Not as wheelchair friendly as vinyl, yet more friendly than cork. Wheelchair users can be jolted along when moving over the grout crevices between tiles. Tile, however, may be a good choice, depending on your needs. Of course, there are many other types of hard surface flooring such as stone, limestone, marble and hardwood. Another common choice among those who require a nonslip floor surface, is rubber flooring. These are just some of the better flooring options for any new bathroom floor or a replacement floor. The option you choose will be determined by your budget, personal preferences, disability needs and whether or not you will need to hire a contractor for the installation. Save up to 70% off Disabled Products Today!